Hey readers, Riley here. I have an amazing kitchen hack that I know you are going to love! The story begins a few years back… I grow some wonderful aromatics (fresh herbs) like basil and rosemary, out in my garden, and typically I pick them as I need them so they’re always at their peak of freshness. Sometimes however, I won’t use them all in my dish, and I hate to see a good thing go to waste. The fresh herbs were quickly drying out and losing their robust fresh flavor. That’s when I remembered this wonderful kitchen hack I’d seen my old friend (who is also a chef) do. She would chop up the herbs at the peak of their freshness, place them into an ice cube tray, and then cover them in Extra Virgin Olive Oil. The next step was setting the tray in the freezer and allowing them to solidify into little herb EVOO capsules! Now, whenever I’m cooking, I can pop one of these out of the ice tray and place it in the pan to melt and join the rest of the ingredients! Tip: Once they’re frozen solid, feel free to pop them all out of their tray and store them in a larger freezer bag or other container to maximize storage space. These little guys work well with any dish that already calls for the olive oil, and could some fresh aromatics! (Egg dishes, potato dishes, chicken dishes, soups, stews… Anything). Check out a tutorial my friend Lauren J has on her site: DiyReady.com. Thanks for tuning in! Are you planning on preserving your own fresh herbs? I especially love freezing basil, good thing the process to freeze fresh herbs is even simpler than you probably thought! Try this kitchen hack for frozen herbs at home. We want to know how it goes! 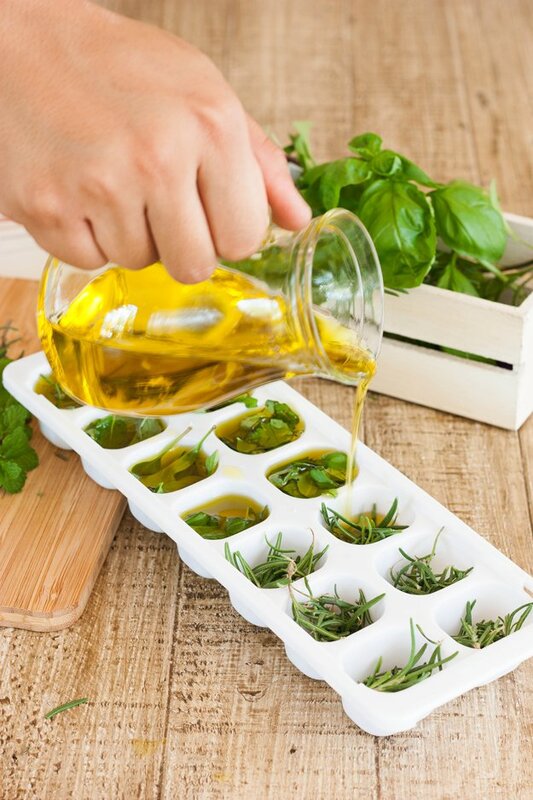 Let us know in the comments section below what you thought of this article on freezing herbs in ice cube trays. We love doing DIY homesteading projects and becoming more self-reliant by learning more about how everything works around the homestead. That’s why Homesteading was created. We want all folks looking to lead a self-sufficient life, either on a homestead or in an urban environment, to come together and learn from each other! Of course, we welcome your help in creating a community of homesteaders. Come and share your homesteading tips and ideas, recipes and expect the best advice on self-reliance and homesteading trials from our team of long-time homesteaders, self-reliant wilderness, and preparedness experts. Want to write for Homesteading? Shoot us an e-mail and make sure to stay in touch on Facebook, Twitter, and Pinterest! Would you recommend freezing cilantro this way as well?! You can also freeze some herbs in plain water. That’s what we do with our basil since we do not use a lot of Olive oil. I don’t buy Olive Oil unless I know where it came from>>> I use Grape Seed oil… Would this work as well?? ?